Bilgola 'Gold' Boat Crew at Bilgola Beach - picture by A J Guesdon. They've Done It! 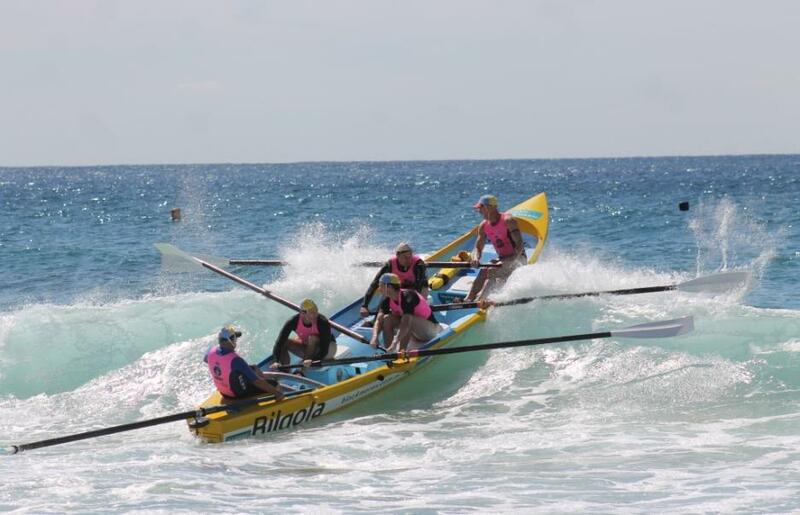 Bilgola's 'Gold' Men's surf boat crew has taken the 2014 TRans-Tasman Test match series 3 to nil run yesterday (8.2.2014) as part of the Navy ASRL Open held at Stockton beach. L to R Jarrad King, Brendan Murray, Don McManus, Mitch Foran, Anthony O'Toole. Photo by Dennis O'Toole, 2014. Pictured here are Shaun Connor, left and Jim Colley preparing for training on their 29er – photo by Damian Devine. The Royal Prince Alfred Yacht Club and peninsula youth sailors, 16 year old Jim Colley and Shaun Connor, 15 have been named in the 2014 Australian Sailing Youth Team, announced by Yachting Australia. Jim and Shaun won the Youth Nationals in the 29er class last month held on Victoria’s Mornington Peninsula. This follows their 6th place at the Worlds in July last year and first place at the German Youth Nationals, and this in their first year in the 29er class. They will compete for Australian in this year’s ISAF Youth Sailing World Championship (Under 19) to be held in Tavira, Portugal from 12 – 19 July. They are the only representatives from NSW to be selected. The team, who will be endorsed by the Yachting Australia Board at their next meeting, will prepare at their individual home locations then head to Royal Queensland Yacht Squadron in Brisbane in April for a joint training camp. Jim is in Year 11 at Barrenjoey High and Shaun attends St Luke’s Grammar at Dee Why. 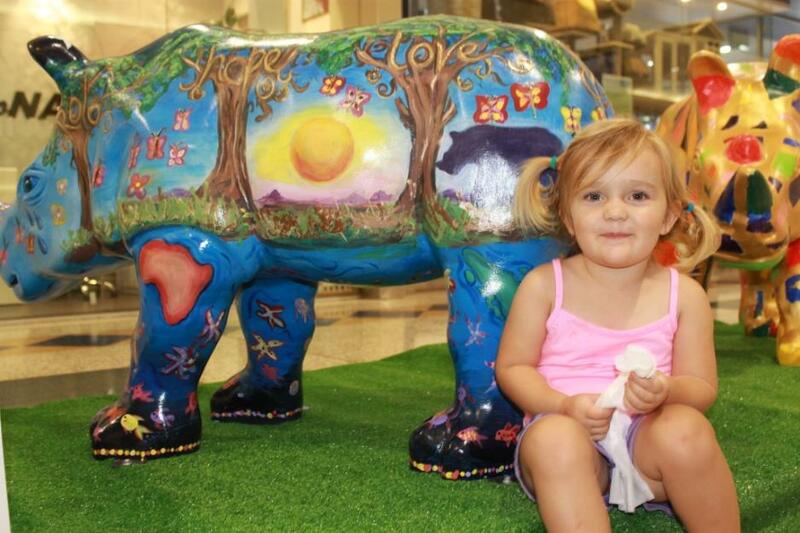 Chloe ( 2 years old) at Warriewood Shopping Centre this week with one of the Wild! Rhinos. Picture by A J Guesdon, 2014. A huge herd of 125 wildly colourful rhino sculptures have charged into town to create a spectacular world class sculpture trail through the streets, parks and public spaces of Sydney, Dubbo and surrounds during February to April 2014 to help raise awareness of the critical plight facing rhinos through poaching and habitat loss. To join the charge, discover the whereabouts of all the 125 Wild Rhinos, download the mobile app or visit here for a trail map. On May 14 the wild artworks will be auctioned at The Star, Pyrmont to raise over $400,000 for Taronga’s rhino conservation programs. Pittwater Residents at Dee Why on Thursday, picture by Michael Mannington. 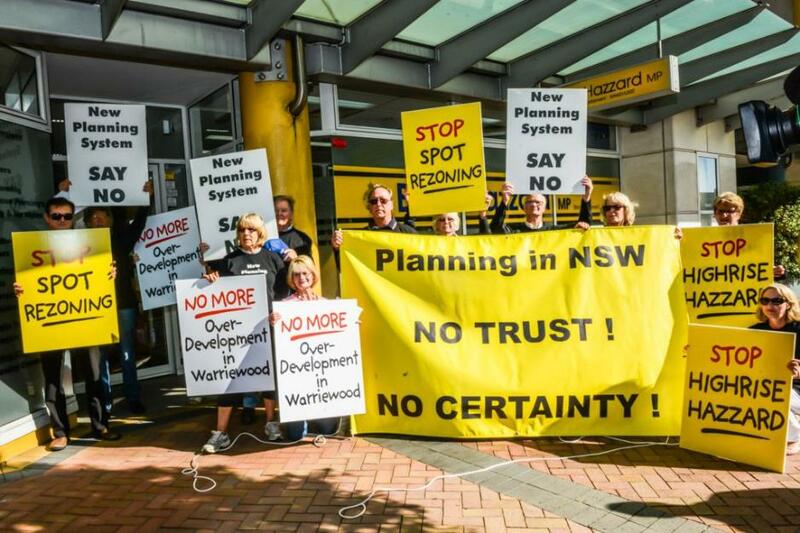 On Thursday Warriewood residents were at the offices of Planning Minister, Brad Hazzard, in Dee Why seeking an assurance that a Meriton proposed development, that contravenes the June 12th 2013 Pittwater Council Warriewood Review, not proceed. The day before (5.2.2014), the proposal which sought to amend the LEP by increasing the permissible residential densities and building height to accommodate residential apartment buildings, and had been referred to the Joint Regional Planning Panel, was completed with the JRPP making a recommendation to the Minister that the Meriton Planning Proposal application not proceed to the Gateway determination stage.